Published on June 25, 2017 by Martyn. Be the first to comment! What a busy week! It kicked off with a brilliant three-day trip to Italy, to take part in the Mare di Libri (Sea of Books) Festival, in Rimini, to promote Tutta la Verita su Gloria Ellis – the Italian edition of Twenty Questions for Gloria, published by De Agostini. My event took place last Sunday morning in the wonderful setting of the Museo della Citta (City Museum) in the heart of Rimini’s historic and very attractive old town, parts of which date back to Roman times. I’m pictured, here, on stage with Simonetta Bitesi, far right, the writer and critic who interviewed me, and Emma, one of the festival’s young volunteers, who acted as interpreter – translating Simonetta’s questions in to English for me, then translating my answers into Italian for the audience. There were close to a hundred people in the hall – the Sala del Giudizio – and it was great to see so many teenagers among them (not least because the event started at 10am!). 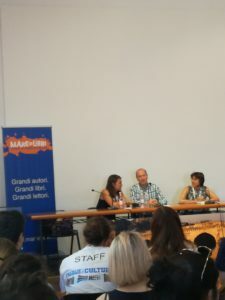 This was the 11th year of the festival, the largest in Italy specialising in children’s and YA literature, and which included leading authors from the U.S. and Canada, as well as from all over Europe. 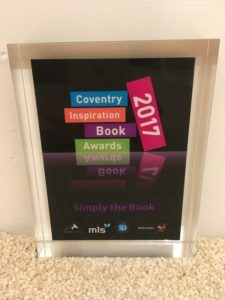 I’d barely returned to the UK, when I was on the move again – this time, bound for the Ricoh Arena – home to Coventry City FC and Wasps rugby club – and the presentation event for the 2017 Coventry Inspiration Book Awards. 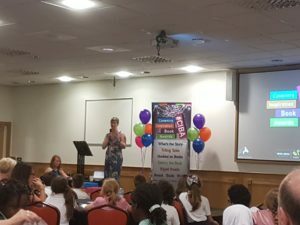 Pictured, right, is Isobel Powell, of the Coventry Schools Library Service, which organises the annual awards, giving the opening address at the event, held in a conference suite beneath the stadium. You can see my left ear and part of my head in shot! There was a real buzz at the event, with so many students of all ages from the participating schools to cheer the winning authors in each category. And here’s a photo of the trophy awarded for Twenty Questions for Gloria in the Simply the Book category (for readers aged 13+), which was presented to me by Snya Riaz, a Year 10 student at Sidney Stringer Academy, who attended the event with the school’s librarian, Lynda Clapham. I’m grateful to Snya and her friend Nadira (sadly unable to be there) for championing Gloria during the voting process – and especially to Snya for saying such lovely things about my novel in her speech.